Summer is here… once a year… in most places. This month is has been so terribly humid, I’ve had to break a life long habit of having fresh flowers in the house, for fear that they will just wilt and die and the first opportunity. Today, for the first time in a LONG time… a little style snippet from Appleketchup HQ. How to make your home look pretty, with things that you can get your mitts on …… ALL year round. 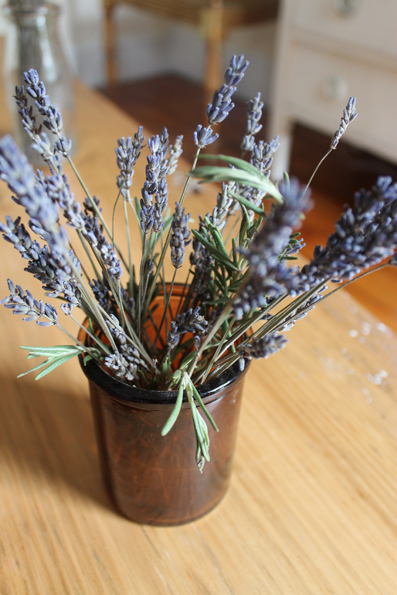 Whilst perusing the local farmers market last Saturday with my darling husband, dear little dog.. and newest member of our family, my shopping trolley bag, I decided to grab a big bunch of dried French lavender. At the time I though it would be a great prop for an up and coming shoot and I could also artfully place it around our home to make it smell nice. Today it’s Friday. Almost a week since the lovely bunch of lavender arrived, and unfortunately it has been there un-openend, all useless and feeling sad; until today, when I had a brainwave. 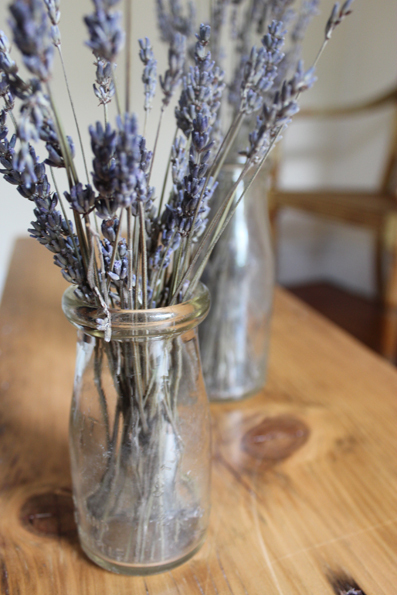 Year round, I thought, you can pick up beautiful dried flowers, mix them with fresh or dried herbs, grab yourself a few jam jars, glass bottles, and throw in a couple of shells…… Done! Vignettes of sun and sea….. ALL year round. 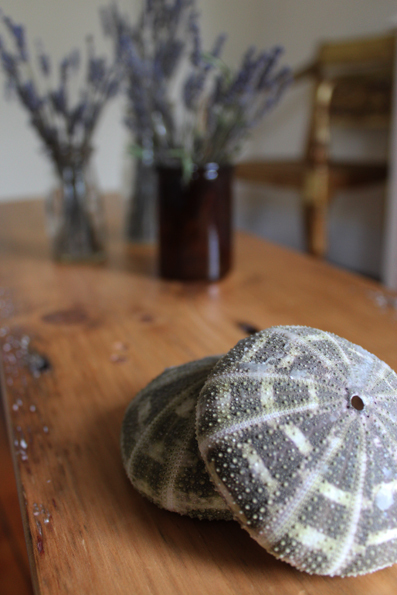 Sea urchins with bunches of dried lavender, rosemary. 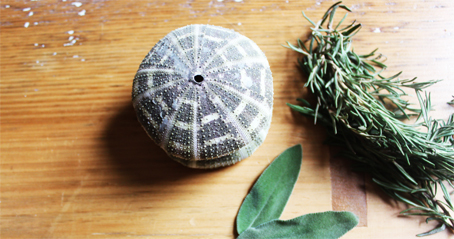 An old candle votive, turned vase… with fresh rosemary and dried lavender. Makes your bathroom smell delicious! Shells and herbs, herbs and shells…. utterly non seasonal! 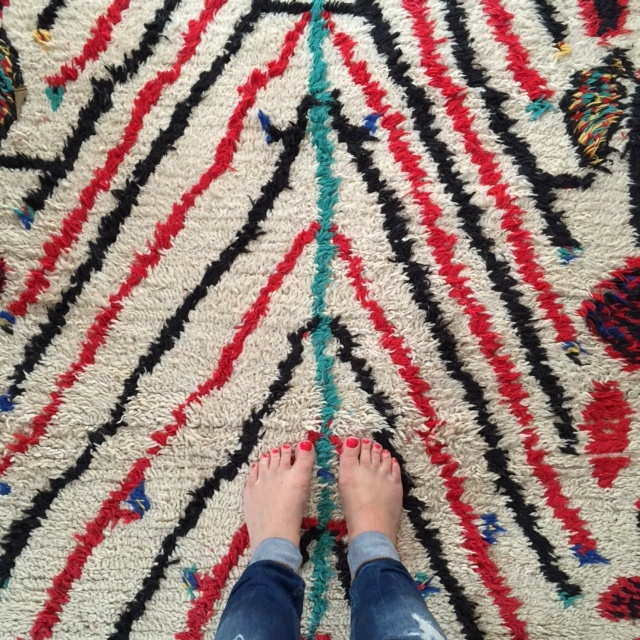 Some old faves of mine… remind me of my wonderful Bondi days and Caravan Interiors….. 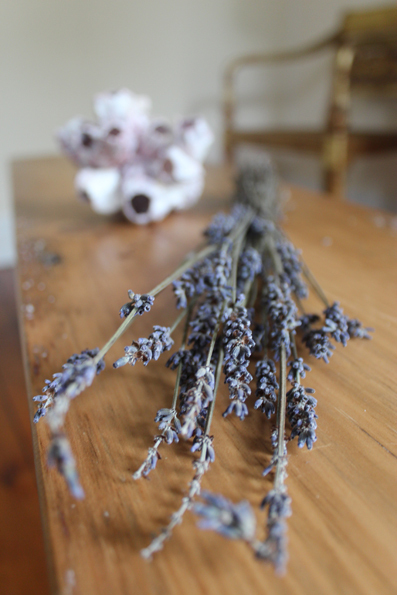 Dried lavender from the farmers markets coupled with a bit of old broken barnacle. 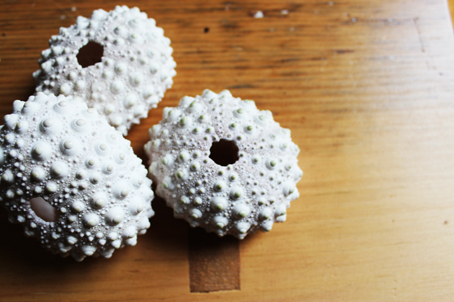 Barnacle pieces can double up as a vase… or a toothbrush holder! When my friends arrive later for a champers and a ‘Go on Great Britain’ for the 2012 Opening Ceremony, I expect they will be blown away by how fresh and beachy our home feels, despite the Brooklyn humidity! Yesterday, I finally gave in to my less than stylish self, and bought a shopping trolley bag. I feel that little bit more New York, (well, Brooklyn), seeing as so many people use them here. I belong. To a certain group anyway. I refused, up until now, to enter into what I have only seen as really not cool. Or daggy, as it may be referred to in Australia. I’ve struggled with bags of shopping, sweated my way through the subway carrying bags of props.. running home to drop off, and then back into Manhatttan. My back has even become a little sore….biting my nose off to spite my own face, some would say. Or, idiot. But yesterday, when I went to collect some items for a shoot, (I told the cashier my assistant had called in sick), funny; my assistant is always calling in sick. I couldn’t actually even carry the bag. 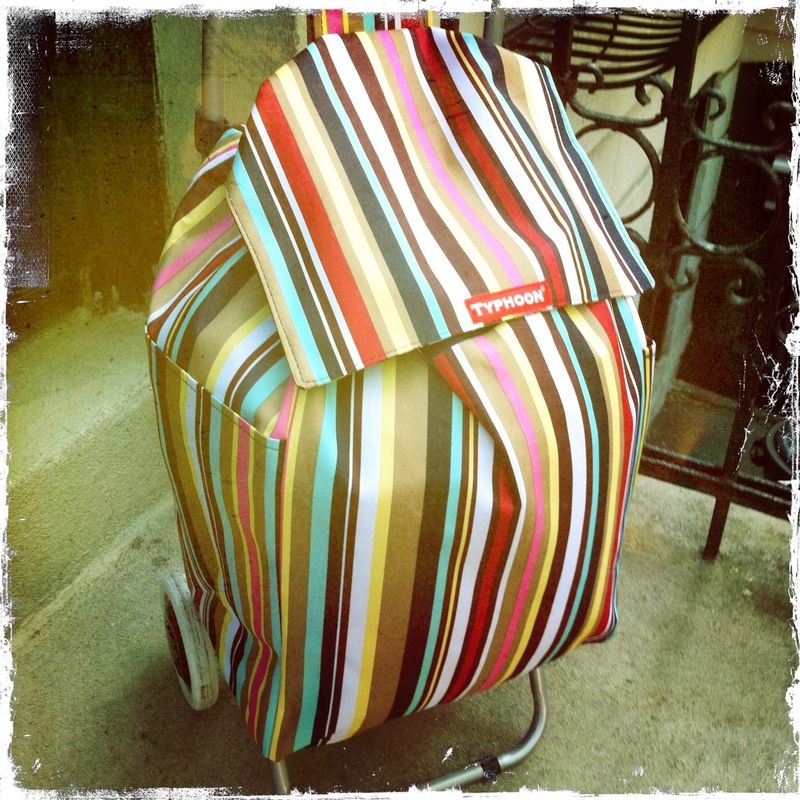 So that was it…I dashed straight to The Container Store where I bought the cutest stripey trolley bag I could find. I assembled it on the spot, popped in my heavy items and stepped out into the sweat box that is Manhattan. I kind of like my trolley bag. I felt so at ease as I swished through pedestrians, feeling rather smug and clever that I’d finally thought of it. The lady in the shop told me as I left…’ You know what girlfriend, you can not only look cute with that bag, you can look clever!’. Yes, she got the sale. 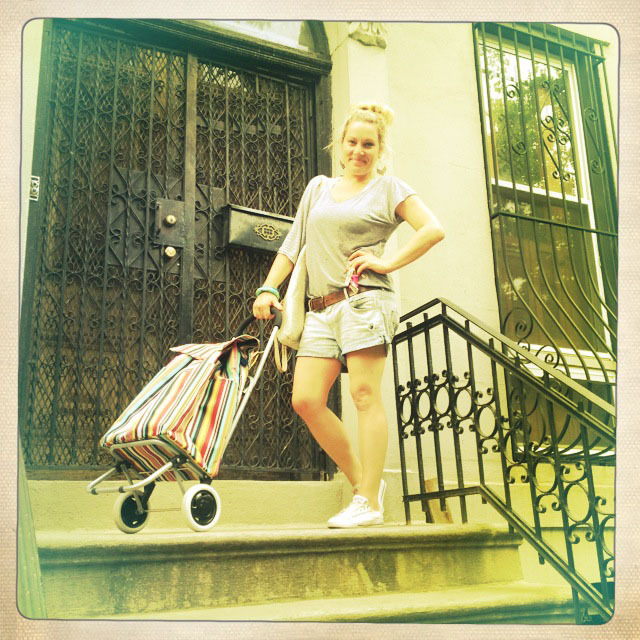 So, finally I belong to a percentage of New Yorkers and Brooklynites who own trolley bags, and I no longer need to struggle. I wear it loud and proud. I think many of my friends might see my job as a stylist in NYC very glamourous. It isn’t always. On Saturday for instance, at ten o’clock at night, when all others are either out drinking cocktails, or snuggling up watching a movie, I’m still out working. I’m at Target, in the Atlantic Terminal, sifting through towels, pillows and kitchenware.. and then dragging it home in the night heat. Now I’ve got this little beauty of a friend to take with me…. it’s very slightly more glamourous. Only slightly. 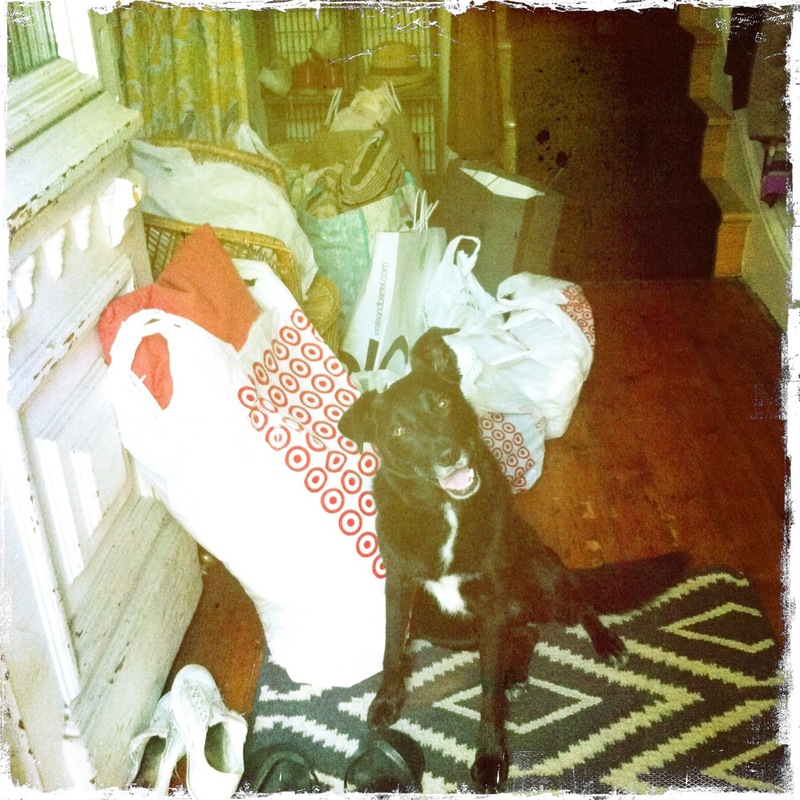 Once I’ve finished prepping for a shoot, our house can often look like someone is either moving in… or out . This weekend was in a league of its own. It really does look like someone was let loose with a credit card and they just could not stop. I guess if I didn’t shop for a living……that’s another group I may or may not end up belonging to. This past weekend was particularly humid, I can’t even compare it to Saunapore… it’s worse. New York humidity is really taking a lot to get used to….. I never realised until I got here, amongst many other things. 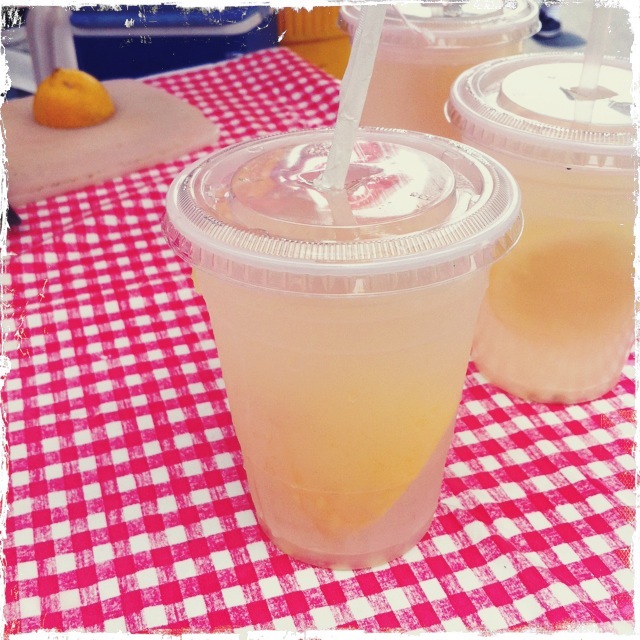 All these years I’ve wondered why my dear former flat mate, who hailed from NY, was so keen on lemonade…. it’s not even fizzy? But as soon as I spied that check tablecolth and lemon juicer, I finally understood, it looked like an oasis to me…… I sauntered over, striped trolley bag at my heel and ordered an ice cold lemonade. It was cool, quenching deliciousness in a plastic cup, right there on 21st and Broadway. Another step into a group I had previously neither known, nor understood.. lovers of lemonade? Now… I appear to be one. Each day, I experience these new things, meet new people, and amongst all the little New York moments I have, I feel like I’m achieving a new sense of belonging. I had one final stop to make on my props trail… Anthropoligie. One of my favourite NY retail destinations… another second home, (not forgetting ABC and Dean and Deluca). The aircon hit me like a welcome hug as I stepped inside. As I began to be drawn to areas of scarves, tops and shoes.. rather than what I was actually supposed to be looking for, (and had been all day), which was a vintage bread bin… I finally admitted to myself it was time to step away from the retail, and go and grab a long overdue 5pm lunch. As much as I adore the place, Anthropologie can be a danger zone, when delirious from heat and hunger. On my way to the till, I spotted a magazine I have never seen before and I didn’t even need to look inside before I knew I simply must have it. 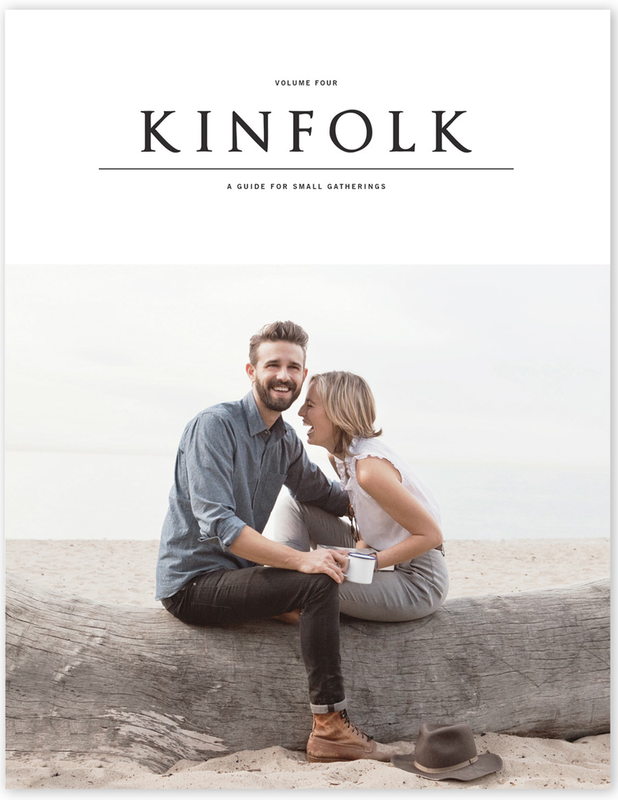 Kinfolk. I had a quick flick, bought it, and popped it in my bag. All the way through my late lunch with a dear friend, my mind kept flicking back to this title. I could hardly wait to hop on the subway and start to read. Once safely aboard the cooling N train home….. I slipped the magazine out once more, and read. My eyes hungrily devoured each and every image. Each looked so natural and effortless… and I managed to read a couple of the small submissions during my short journey. Both, touched me deeply. I am so happy to have found such a wonderful title. Filled with such amazing talent. A couple of pieces stuck in my mind. One was a short essay by Lizzy Sall named ‘Brooklyn Breakfast’ documenting what it feels like to be up before the city awakes, and the sidewalks start heaving. It describes the quiet calm of Brooklyn, down by the water at sunrise, looking over the city…. “For just that brief spell, a breeze comes off the river and we forget that in a few short hours we will be wiping the sweat from our brows, frantically fanning ourselves with the morning paper.’ Upon reading this, I felt like I’d been allowed into an exclusive little club….. what an amazing idea… it’s now on my to do list for the summer…. get up at 5am and watch the sun rise over the city with a picnic breakfast. The other, a short but poignant piece, by Rebecca Martin named ‘Eternity in an Afternoon’. It’s about how tiny moments in our life may flash by quickly, but the memory of them will last an eternity. It really hit a nerve with me, and took me back to an earlier piece I’d one written….. about memory….. If you are a lover of the aesthetic, food, gatherings, or the idea of Brooklyn before sunrise. Then order this magazine. It’s really beautiful. Each page of this volume, to me, is about belonging to something. Whether it’s a large group, small gathering, or something solo…….. I don’t yet know these people, but I hope to one day meet them. Something tells me… we may be akin. As my train was drawing in.. I had to put it down, temporarily. As I did, I noticed a quote had been placed on the outside back cover… one by Mitch Albom, (Tuesday’s with Morrie).